While the Delhi market is chock full of Asian options, the home delivery segment has limited quality restaurants catering to it. The first time I sampled Asian Haus was at a friend's wedding party. The food was delicious and I tucked the name away in my head for future use, not sure when I would be able to use them for an elaborate catering gig. At the time, the outlet was based out of Gurgaon and I lived in the heart of Delhi. Over a year later, the brand has expanded to include both Asian and Sushi Haus and both have become household favourites, given their bold flavours, quality ingredients and prompt service. Interestingly, they operate only as a delivery unit; there is no restaurant where you can tuck into the goodness of their meals, but this model seems to have worked well in a food-heavy Delhi market. Since you can order from both outlets with one phone call, let's begin with the sushi rolls. Vegetarians have plenty of reason to cheer as the menu embraces green variations and sees this as an opportunity to grow this part of its menu. While the quinoa rolls looked gimmicky on the menu, they were a big surprise; the asparagus tempura roll was crunchy and well crafted. The avocado roll is also recommended as it comes wrapped in a thin layer of avocado rather than the traditional seaweed. As far as the non vegetarian sushi options go, the crunchy spicy tuna roll may get the Japanese to roll their eyes but it is perfectly suited for the Indian palate. The chicken katsu roll is also inventive, with a spicy curry-like filling that surprisingly works well in a sushi roll. For mains, the menu at Asian House is recommended. Try the Malaysian curry which is described on the menu as 'A classic Malaysian chicken curry scented with cumin & flavoured with lemongrass; partnered with potatoes & finished with a hint of coconut milk.' The dish delivers on the earthiness it promises and is best enjoyed with steam rice. The Cantonese noodle can be had as a meal in itself and is a flat rice confection tossed in soya sauce and topped with a creamy egg threaded sauce of chicken and shrimps; drizzled with crispy noodles. 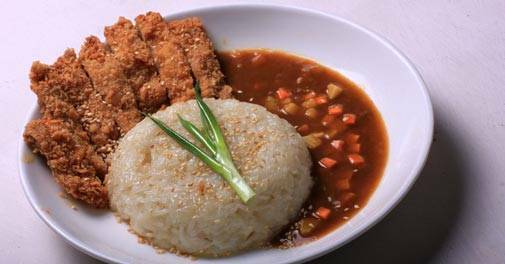 The Japanese katsu curry is a hearty curry meal flavoured with carrots and potatoes, served over sliced crispy breaded tofu or chicken, served with sticky rice. While the flavours are interesting enough, the chicken strips are tasteless on their own and reminiscent of fried chicken. Vegetarian options are also available in almost all curries and mains and the ingredients are fresh and tasty. While the Delhi market is chock full of Asian options, the home delivery segment has limited quality restaurants catering to it. Asian and Sushi Haus have attempted to change that by giving people in both Gurgaon and Delhi an Asian menu that is not influenced by Indian flavours and is instead true to its origin. As winter sets in, the two become excellent dine-in options for those looking to warm themselves and eat a good meal without stepping out.